The Scritchy story may be fun for both you and your child. The vocabulary isn't a lower-grade solo reading level. Instead, the story is designed to appeal to children being read to by an adult. When baby squirrel Scritchy climbed out of his nest in the tree, he walked easily along the branches. And jumped from branch to branch. It was the best part of being a baby squirrel. But he didn't climb down the tree trunk. And he didn't climb up. It was too scary. He was afraid he would slip and fall all the way to the ground. Scritchy's sister wasn't afraid. She ran up and down the tree and around and around the trunk and called to Scritchy, "Come play! It's fun!" But Scritchy wouldn't do it. He was afraid to climb up and down. The other squirrel children laughed at him for being scared. They called him Scaredy Scritchy. When he grew a little bigger, but still a squirrel boy, Scritchy practiced at night when the other squirrel children were sleeping. So they wouldn't laugh at him. He dug his claws deep into the bark of the tree so he wouldn't slip. He took one step, then another step. Then another. It took a long time, but he got down to the ground by himself. It took a long time to climb back up, too. Scritchy practiced every night. It always took a long time. And he was always afraid. But he did it anyway. One night on the ground he was having fun jumping on leaves and eating nuts. The morning came and he was still on the ground. The other squirrels would see him if he climbed up. And laugh at him, because he was still afraid. So Scritchy decided to explore along the ground. He saw a cliff nearby and wondered what was at the top. He followed a path that deer and other animals used. When Scritchy got to the top, he discovered a tree growing right next to the cliff. It was taller than the cliff. It was so close to the cliff Scritchy jumped right onto a branch. Then he jumped back to the cliff. And again to the tree. Back and forth. Back and forth. "Look! 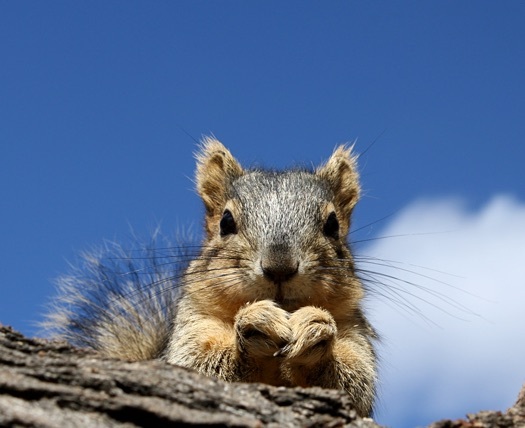 ", Scritchy shouted and woke up all the other squirrels in the woods. "I don't have to climb up and down the tree. I can jump from the cliff." Use this form to send a private note to Will Bontrager, the author of Scritchy, the Squirrel.